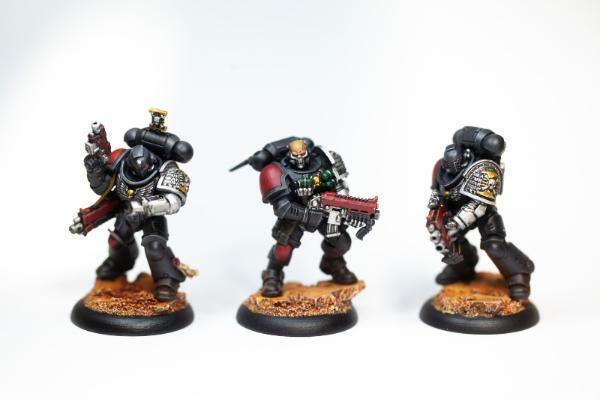 derd0m's Deathwatch - *NEW* First Intercessor Squad finished - woohoo! 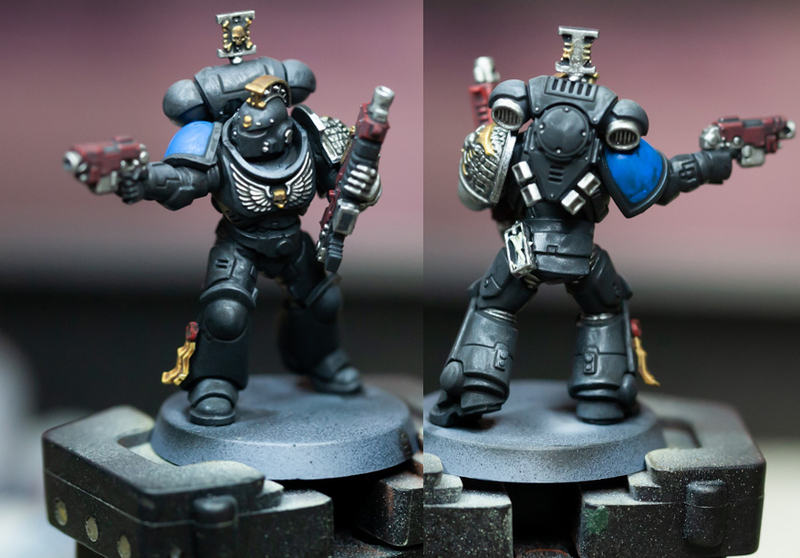 Subject: derd0m's Deathwatch - *NEW* First Intercessor Squad finished - woohoo! Hello and welcome to my restart! First of all the necessary background story, which began in 1995 as a little boy in Germany. My first army consisted of about 2000 points Ultramarines, I played the 2nd Edition and all painting attempts failed miserably. After I had dismantled about 50% of my army gradually with Grandpas air rifle, the hobby was done for the time beeing. After a long break of many years, I started again with two friends and gathered various armies over the years. 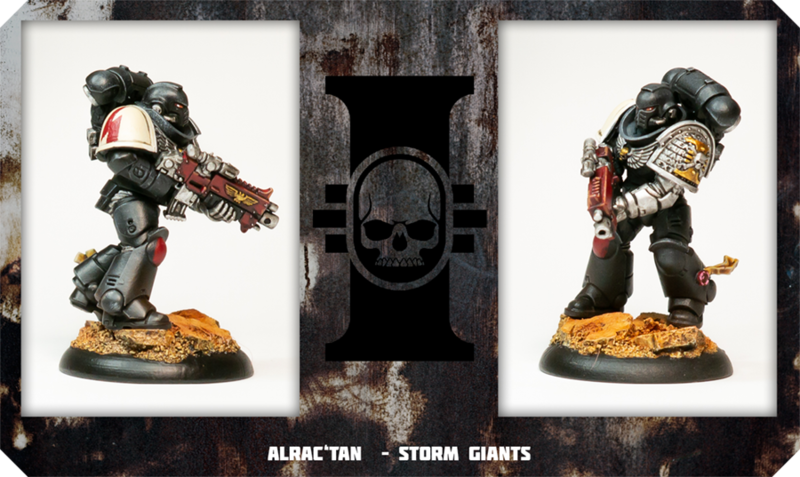 In addition to the game I was more and more fascinated by painting of the minis and so I started a little blog, which was about my own armies and a few commissions. 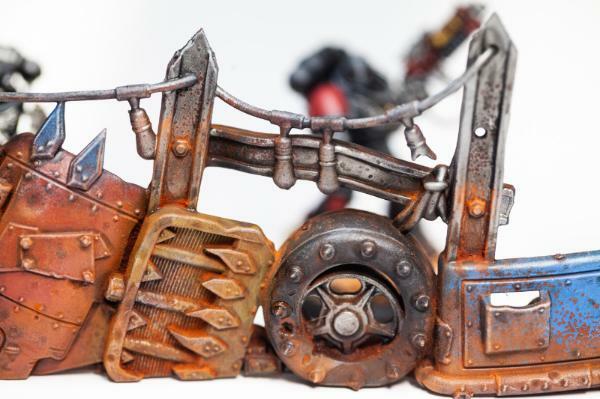 Some old minis can still be found in Google Image Search under the term "Krautheadstudio" and in my Dakkadakka Gallery. Dakkadakka informed me on my login today that the last one was done in August 2013. At that time, all the armies were sold, the bits auctioned on ebay and the colors dried. Changed priorities - wedding, kids, own home. Now I start again, kept a lot of theory, unlearned all the practice. My first army consists of approximately 2000 points Deathwatch, which is now fully assembled. 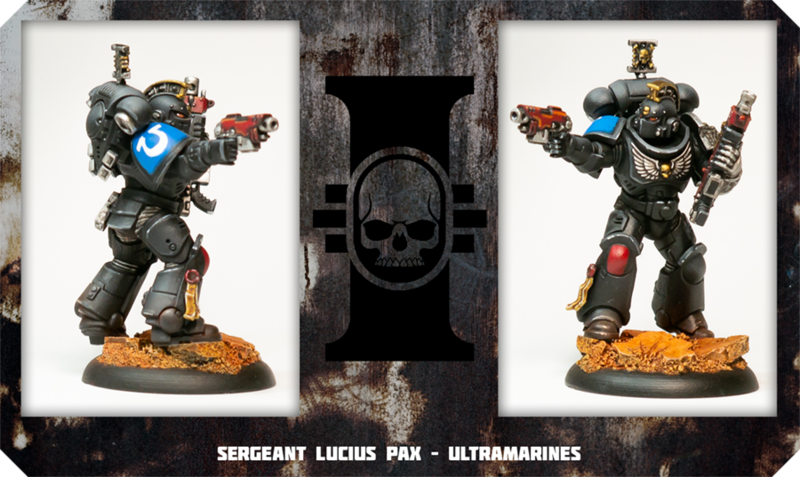 To get warm again with the brush, I painted one model from each unit of my army. Here are my first attempts after almost 6 years break! Although I have tried different techniques, the minis are comparable to the look. 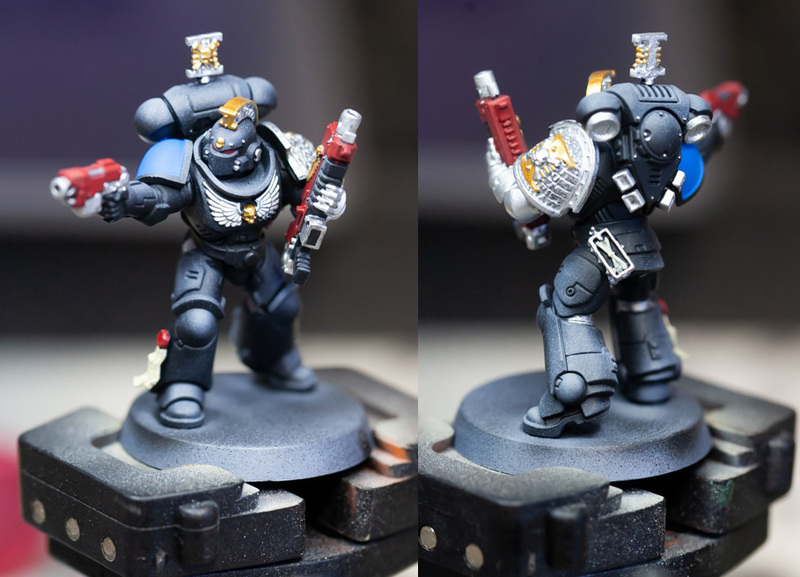 Depending on the Mini, only the Drybrush was used for the highlight, in other edge highlighting, or a combination of both. I used almost exclusively Vallejo colors, since I was very satisfied with these in the past. The black basecoat and a coarse highlight with gray are made with the airbrush, the rest is done with a brush. Without basing I need about 2 hours for a mini, which makes me very satisfied. Of course, character models get some extra love, but first I want to be a little safer with the brush. Beside the shown minis I already finished a venerable dreadnought and an Inceptor Marine. Since they are currently not based I didn't take pictures of it but will do so right after the basing is finished. I will try to keep you guys updated regularly, next up will be the completion of my Intercessor Squad. Oh my, I could cry looking at my old signature. 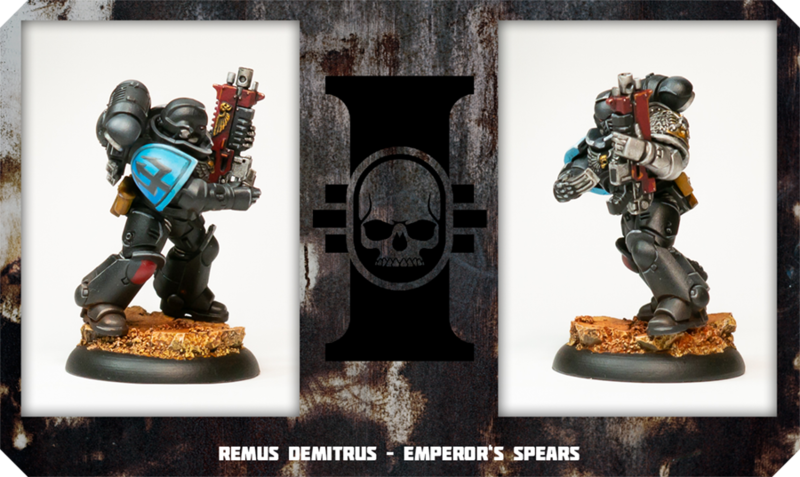 Subject: derd0m's Deathwatch - My restart in the hobby after 5 years. Oh my. They look good to me. 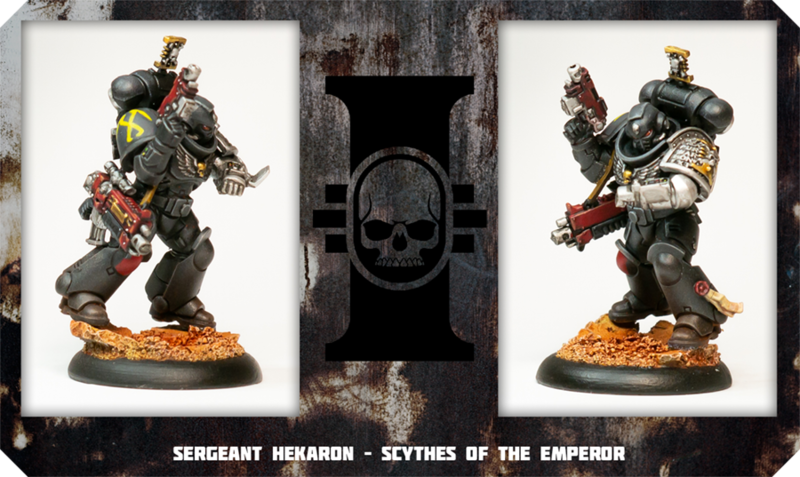 Cool basing style. 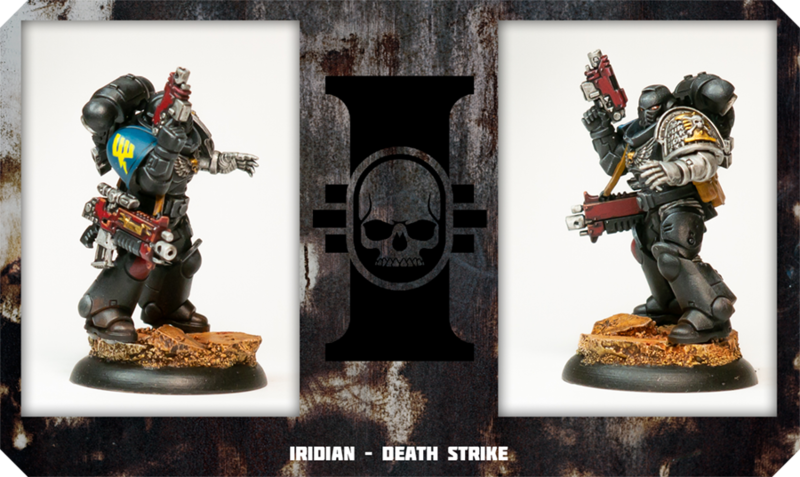 As promised here are some shots of the finished Dreadnought and first Inceptor dude. I might have overdone the plasma glow effect a bit and should have practiced it on a less important mini but oh well - too late. As you might have recognized the right shoulder pad of the Inceptor is not painted yet. 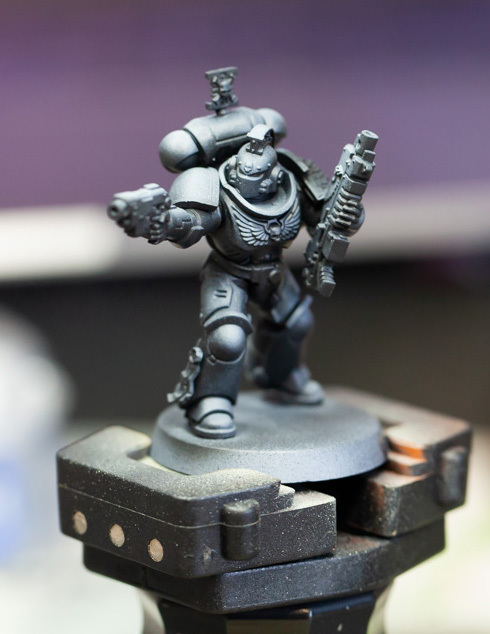 I'm still unsure wether I should equip the new Primaris marines with one dedicated pad color (would go for red then) or go full freehand and make pads for various chapters. 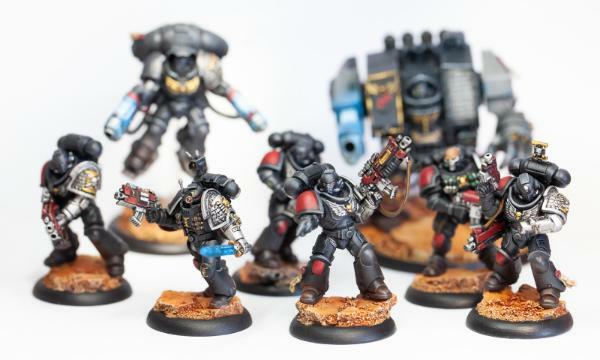 The codex states that good ol' Roboute reinforced the Deathwatch with Primaris Marines in size of a full chapter. 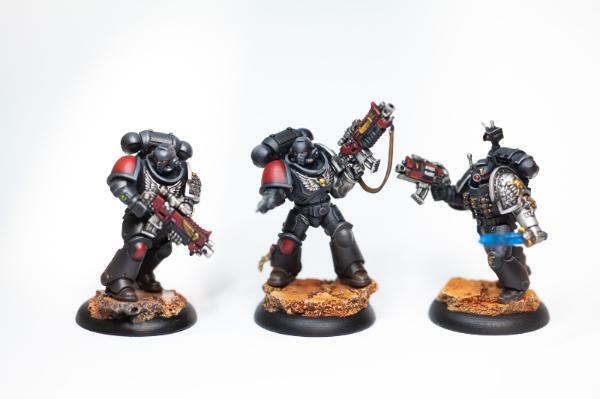 Were those dudes already part of existing chapters or were they sent to the Deathwatch directly after... "birth"? Any fluff help in that regard is highly appreciated. 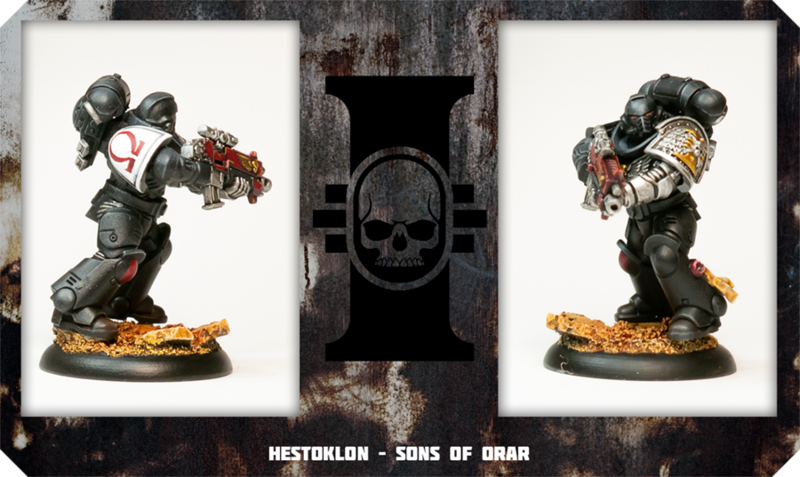 Subject: derd0m's Deathwatch - My restart in the hobby after 5 years. 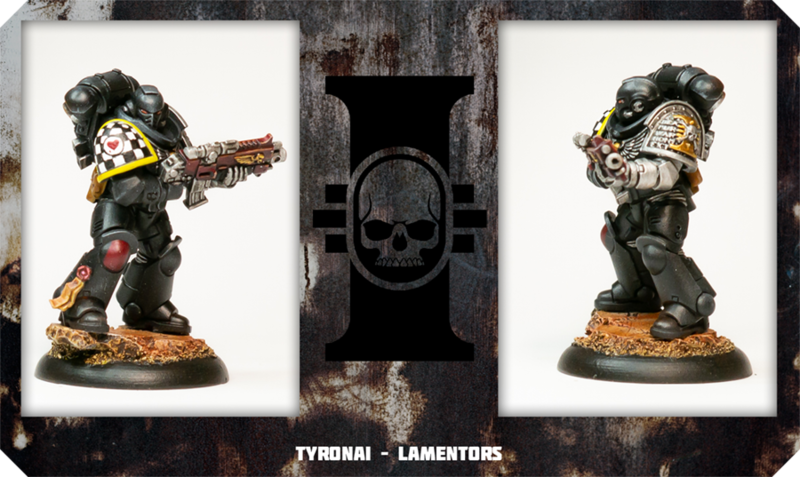 New Ven Dread and Inceptor! Welcome back to the hobby! Your DW looks great, you've done a good job on the black and that's a tough color to paint convincingly. You're right about the plasma glow though, it's a bit overdone. Doesn't look horrible, but maybe a bit more subtle next time As for the lore question, I have no idea. 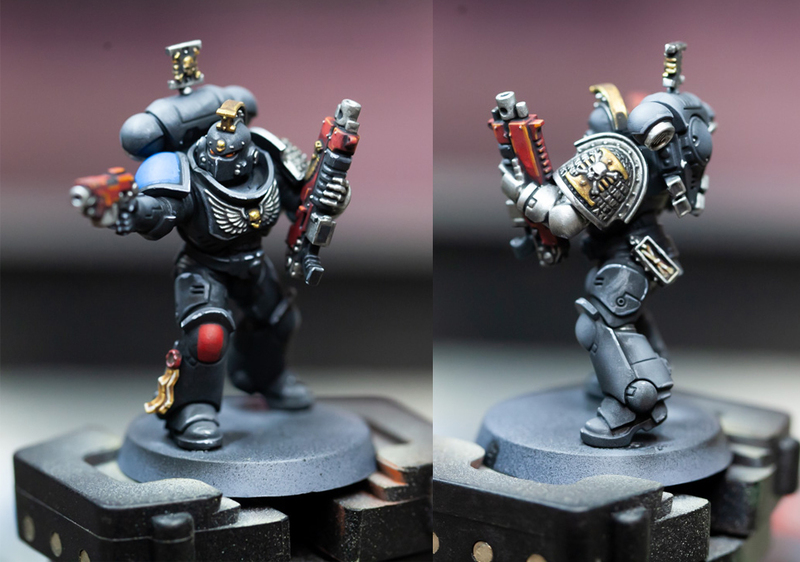 The official primaris DW seem to have the pads painted just like the regular DW, and personally I would follow it to get a chance to paint little one-off freehand designs! And just like youwashock, I dig the bases! 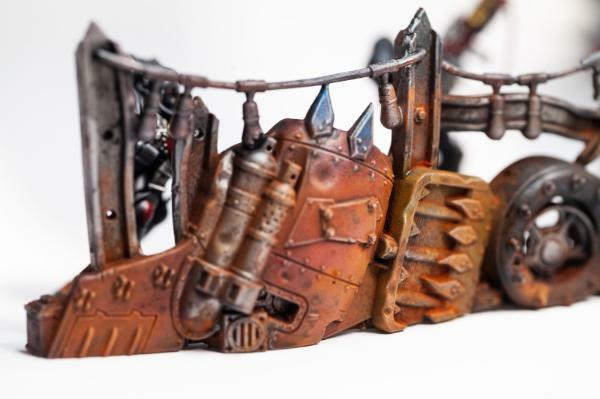 I do something similar with my models, painting-wise, but yours seem to have more red in them. Would you mind sharing your recipe? 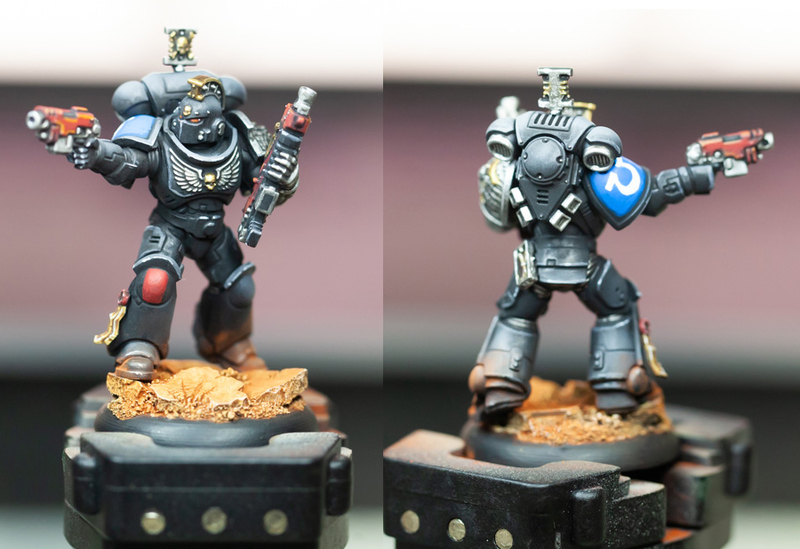 I was able to paint another Intercessor Marine over the course of this day and managed to snap some photos of the different painting steps including the basing. This time I decided to go full edge highlighting without using the drybush. Still not sure which way to go, I kinda like both looks. I've also done a bit of shading on the red colors of the bolt rifle and knee pad, another highlight from above is made using the airbrush with a neutral grey. 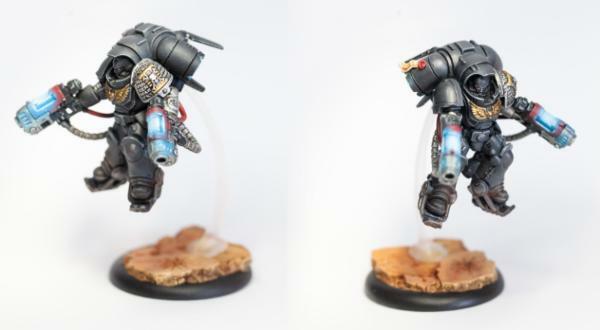 Mounted on the actual base (Microart Studio Ruins). The base is airbrushed with a sand color, washed with Vallejo Sepia and then drybrushed with white. The red tones are added using pigments (Vallejo Dark Red Ocre and Burned Siena), after varnishing the pigments darken a bit. I also did my first freehand on the shoulder pad, go smurf! Thats about it, the mini took me roughly 2 1/2 hours without drying times. 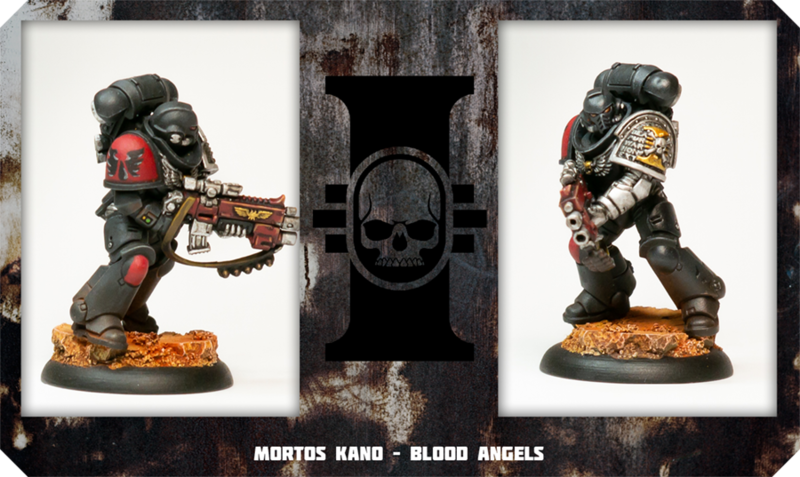 Next up... more Intercessors! New guy looks pretty darn awesome. I don't think the plasma is overdone on the Dread, either. 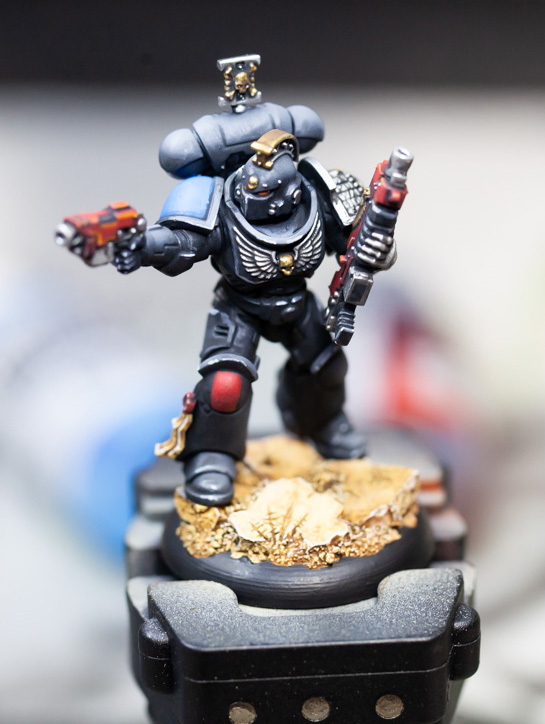 Figure he is right in the middle of blasting fear of the Emperor into some xenos. Ah, so it's pigments that give the bases that sweet color! I paint my bases pretty much the same as you, but haven't tried pigments yet. I definitely will some day! Great job on the freehand! Haha! It's not that the look is totally off but I think the OSL emitting from the plasmacore should have a darker color. There are still 2 Plasma-Inceptors in the queue where I try to fix this. Ah, so it's pigments that give the bases that sweet color! I paint my bases pretty much the same as you, but haven't tried pigments yet. I definitely will some day! Great job on the freehand! Pigments are just lovely as the effect you get is quite awesome for one minute of slobby brush strokes. Just don't inhale too much since that gak flies everywheeeere! 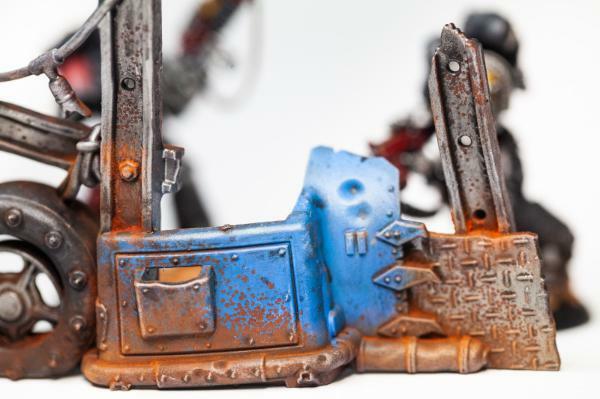 Also be careful with the varnishing and keep a distance to the mini since you could easily blow the pigments away. Some quick and dirty in between. Since our current rudimentary terrain is proudly sponsored by Fireman Sam and Playmobil it was time to put paint on some existing speed freeks terrain. I left a few small details aside like the lightbulbs since I did the whole painting process with the airbrush to speed things up. The whole process took me around 90 minutes excluding drying times and I'm pretty pleased with the overall outcome. Finally a noteworthy update! After getting some more bigger terrain done (will post some pictures some time later) I was finally able to finish my first 10 man Intercessor Squad. I painted the first six minis one by one and tried a bit of batch painting with the other 4. The quality isn't as good as it could have been with more patience but well... THEY ARE DONE! Shoulderpads took me ages, some went well, some didn't - but I learned a lot in the process. 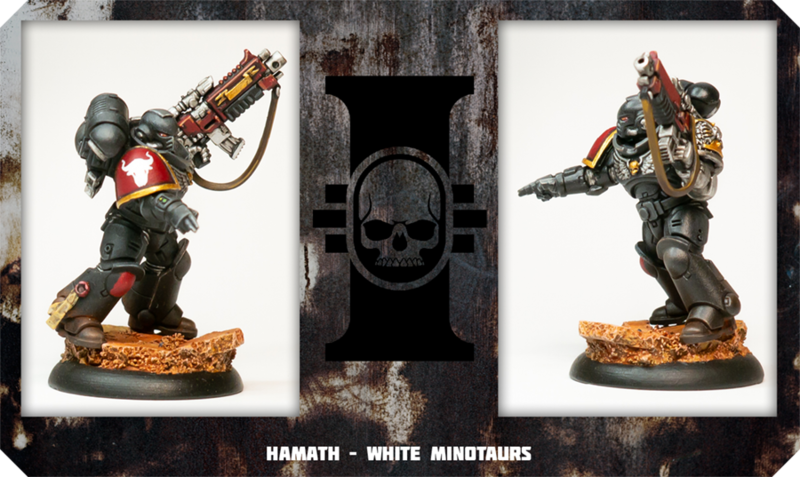 My personal favorites are Hamath of the White Minataurs and Tyronai of the Lamentors, who hopefully will play a tragic role in my upcoming battles . Feedback and critics are always welcome! Great looking models and I am a big fan of the presentation. Very slick. Love it!! Great looking minis. Aren't soul drinkers backing purple though? Thanks a bunch! Before I take care of the more interesting models I really wanted to finish a complete squad first although it got a bit exhausting at the end. 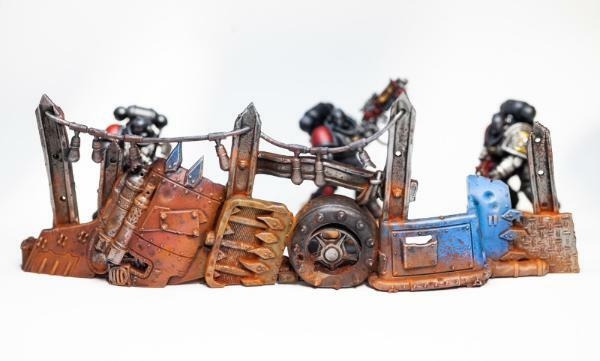 Not sure what to paint up next but I might go for my first vehicle and starting on the Corvus Blackstar. Ha! 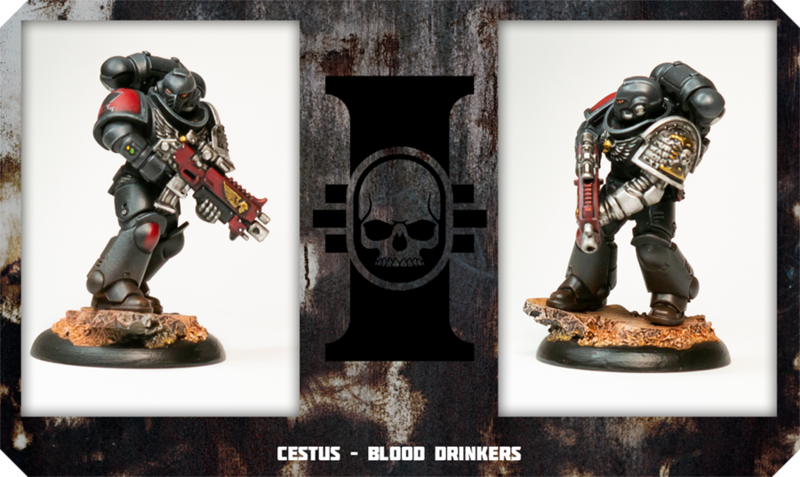 You are totally right, I screwed up the Chapter - should have been Blood Drinkers, datasheet is corrected.